When I met with the community relations manager at Barnes and Noble, she introduced me to a coworker. 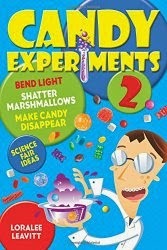 "Candy Experiments?" he said. "I just in the newspaper about another mom who was doing that!" Actually, that was me. My daughter and I had a great time demonstrating experiments to a local reporter--read more here!